This new postgraduate taught course will train the next generation of scientists. Those graduating from the programme will be in high demand across the marine renewable energy sector, working for device developers as resource analysts, entering oceanographic consultancies working on in situ and modelling studies for the wave & tidal industry, geophysical surveying for the industry. There will also be opportunities to work on grid infrastructure (National Grid) and cabling, for leasing bodies such as The Crown Estate, and working for government-sponsored environmental bodies such as Natural Resources Wales, assessing environmental impacts. Graduates of the course will be able to understand and predict marine energy resources over time-scales of less than a second to decades to quantify mean and extreme loadings on the energy infrastructure, as well as fully quantifying the resource to aid industry in location and design choices. The students will learn how to use state-of-the-art oceanographic and geophysical instruments on small boats and the 35m RV Prince Madog, they will learn how to run and critically analyse the results from wave and tidal computer models, and use their own collected data to tune these models. The course provides students with a solid grounding in mathematics, ocean physics, and geophysics, and examines in detail the challenges faced when placing farms of devices in the marine environment. The new course builds on over 50 years of teaching experience on the MSc in physical oceanography in the School of Ocean Sciences. 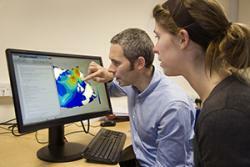 The Ocean Physics group, who deliver the course in the School of Ocean Sciences, have world leading impact, as acknowledged by the 2014 Research Excellence Framework (REF). The School of Ocean Sciences has extensive links with the marine renewable energy industry and, following the taught part of the course, many of the summer research projects will be in collaboration with industry.